That is so much money!!! Yes, it is! I totally agree. I am not going to downplay the fact that it’s a serious chunk of change. This is why I offer payment plans. I wager that if you took a real look at your finances, you would be able to make the payment plan happen. If you aren’t willing to look at your finances, it’s a good indication that private practice, and this program, might not be the best fit for you right now. There’s an intimacy with money that is necessary to be successful. The group where we unpack finances is the group with the highest used tissue count. Let’s do some math (it’s fun, I promise). My goal for my insurance-paneled practice-builders is that they are “full” (by their standards) by 6 months. Let’s call 23 clients per week full for this example. Let’s start from “full at month 6” and look at the rest of the year since the first 6 months is building and harder to estimate. Let’s say insurance reimburses you $100 per session (my average insurance reimbursement has been $109 per session). Now let’s add a 2 week vacation, too. So from month 6 to month 12, you’ll pull in $55,200 in 6 months (even though you took 2 awesome weeks off). Which means when you stay full the following year and take SIX weeks off (‘cause balance is key!) you’ll make $105,800. Maybe we can stay conservative and make that more of a round $100,000 because of random unfilled slots. Perhaps even more conservatively, we assume that in your first 2 years of private practice you make $150,000 total while working less than 30 hours per week. Sounds great, right? Do you think you can afford it now? Let’s do the math in another way. If you got one client whom you saw weekly for 6 months, you would be making more than this group costs with just one client. And you’re going to have as many clients as you want. Furthermore, I want you to consider what you will be avoiding by investing in this group. Wasted Time: You don’t have to spin your wheels for months or years trying to figure this out on your own.  You will have a roadmap, a guide, and a to-do list. You don’t have to waste time not making money while you’re figuring out the next steps. Loneliness: People talk about private practice being really lonely. Personally, I have a nearly insatiable need to connect so I’ve figured out how to do private practice in a way that works for me. Don’t let that scare you, introverts. We all need connection outside of session and you get to decide how much you do it, I just show you how. Additionally, the group is a great place to develop supportive relationships with people who get it and it helps you build community in your city. Burnout: All that wheel-spinning can be exhausting—and depressing if it’s not yielding results. If you’re putting your heart and soul into it and your phone still isn’t ringing, the silence is deafening. If you are avoiding doing the work because you’re frozen with fear, you’ve got that guilt to contend with. I don’t want you to go through that. It’s not necessary. Worry: I’m going to be honest; I can’t take away your worry any more than you can take away your clients’ worry. 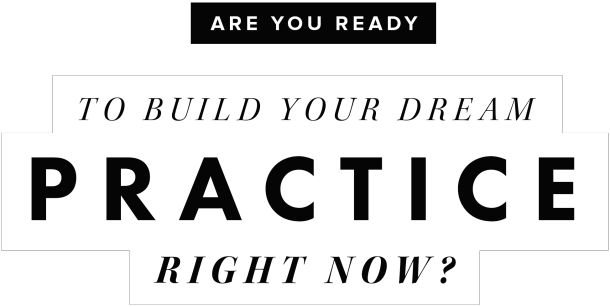 I can show you how to build the practice you want like you can show your clients how to build the life they want. It’s up to you to do the work and you’ll have me, and a community of other practice-builders, who will have your back. It will prevent you from falling into the trap many therapists fall into, which is, when you’re practice is going alright, you wonder if you can trust it. You worry about the summer months and December. You aren’t entirely sure which marketing tactics are working and which aren’t. That’s a snake pit you can avoid. Let’s avoid snake pits. Let’s get back to money; and I’m going to be harsh here. You know what else cost a ton of money? Those grad courses your curriculum required that didn’t provide any real-world application. I just looked at tuition at my alma mater and an MSW costs $4,044 for in-state tuition and $12,181 out-of-state per semester. Holy smokes! Yes, I got a degree but until I went into private practice, I owed more in student loans than I made in a year. There’s a big return on investment with this group, enough to make me love math. For anyone still freaked out by the investment, take heart that there’s a Money Back Guarantee. I want you to get what you need from this program. I don’t want your money unless you are getting value from it. By mid-course, you’ll know if it’s right for you or not. If you participate in the first three groups, attend the peer support groups, do all the homework, and don’t feel the group is going to meet your needs, I will happily refund your money. I want you to be super-successful but I don’t have to be the one to get you there.